On Saturday, September 9, Lampeter-Strasburg Girls' Soccer teams had an away game at Elizabethtown. The Varsity game started at four and the Junior Varsity game starting at 5:30. However, with 14 minutes left in the first half of the game lighting was spotted. The rest of the game was postponed. White is Mannheim Central is in white and Lampeter-Strasburg is in blue. Before that on Thursday, September 7, the Girls' Soccer teams had an away game at Manheim Central. 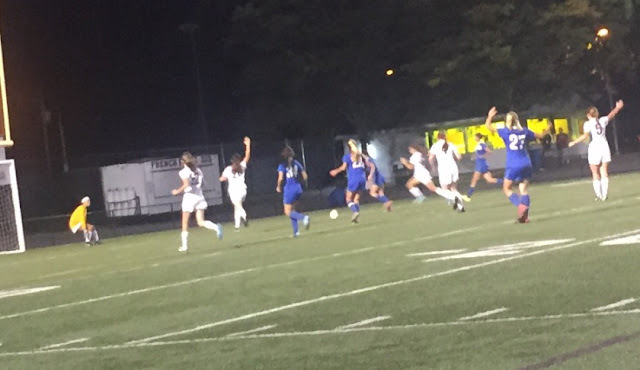 The Varsity night game started at seven and saw the Pioneer victorious beating Central, 1-0.